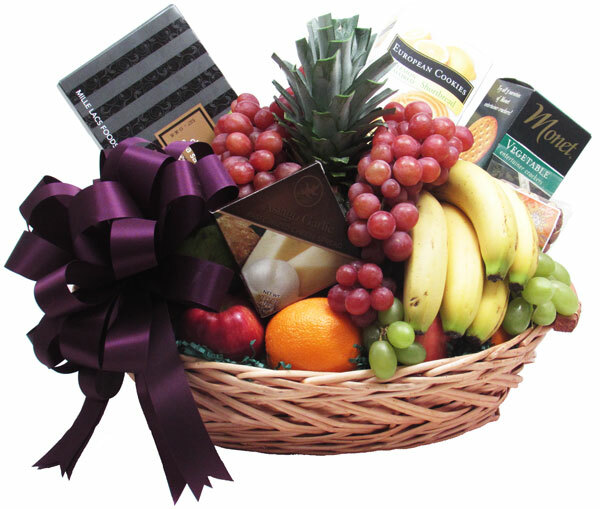 This beautiful basket with handles is filled full with a healthy selection of the finest seasonal Fruit, carefully chosen and beautifully presented! A perfect gift for almost any occasion! And unlike cut up fruit, the fruit can be eaten over several days versus having to be consumed in a few hours. Wrapped in crisp clear cellophane with a colorful fruit print and topped off with a big beautiful handmade bow. Includes a handwritten greeting card. Choose between all fruit or fruit with other goodies. Shown with goodies (box of Dark Chocolate Sea Salt Caramels, box of Crackers, Cheese, box of Shortbread Cookies, and Nuts) 14 - 16 pounds. For 2019, we'll be using a basket with a little darker stain. Wrapped approx. 15"h x 16"l x 12"w.
NOTE: FOR LOCAL DALLAS AREA HAND DELIVERY ONLY. No fruit baskets in December or on Valentine's Day.